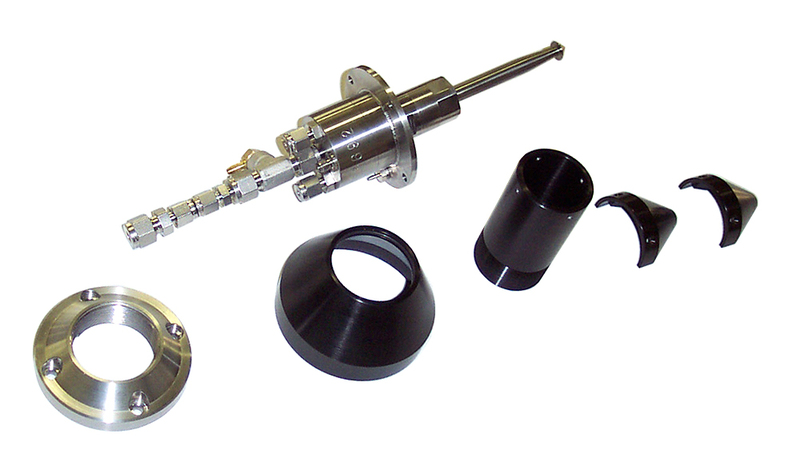 A specially designed nozzle for atomizing various molten metal alloys. Typically used in the creation of solder powder, the Molten mist uses ultrasonic energy to create uniform and repeatable droplets. The MoltenMist is a unique ultrasonic nozzle designed to atomize molten metals and other melts, such as solder, for production environments in solder paste manufacturing. In applications that require a very precise diameter size, such as solder powder, commonly used to manufacture solder paste, ultrasonic nozzles are a perfect fit. Ultrasonic nozzles have long been known to be an ideal tool for atomizing molten metals and melts, such as solder. However, temperature constraints and wear on a nozzle’s atomizing surface have made them impractical for production environments. The MoltenMist line of ultrasonic nozzles overcomes these problems by employing dual air/liquid cooling, and a simple, replaceable atomizing surface design. This proprietary cooling method keeps the nozzle’s heat sensitive piezoelectric transducers well within safe temperature limits, even when atomizing molten liquids. 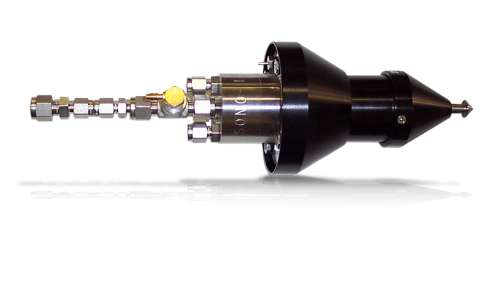 For corrosive liquids, it is a simple procedure to install a new titanium atomizing tip when corrosion starts to affect nozzle performance. By placing a liquid feed tube in close proximity to the atomizing surface, and flowing the molten solutions onto it, flow rates are capable in excess of 80 ml/min in air and 100 ml/min under vacuum or in inert atmospheres (With SN63PB37 molten solder, 680 g/min in air, 850 g/min under vacuum).